You don’t do one in ages then two come along together! 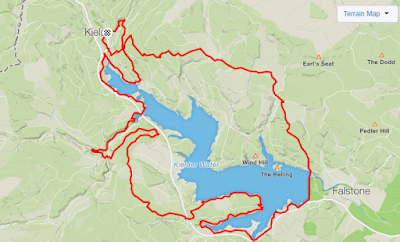 Well, a fortnight apart to be precise and two very different races, the first one, the Self Transcendence 50km covered twenty-one laps of a flat tarmac loop of 1.47miles at Perth’s North Inches and the second one, a hilly trail with the only real flat bit being the length of Kielder Dam! I did have a bit of a dilemma when I realised Perth clashed with the beautiful Loch Katrine Marathon, I love that race and was sorry to miss it, but with the Anglo-Celtic Plate coming to Scotland once every three or four years incorporating an open 100km and 50km I wouldn’t get to run round the Inches again for a good few years. 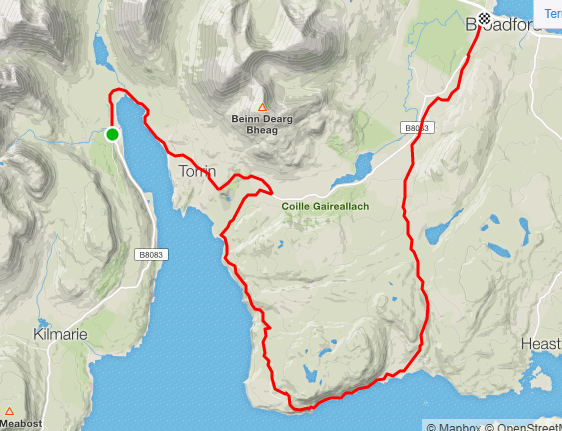 It might sound a bit boring running round and round but it’s a lovely loop that flows nicely and having done two 24 hour races on it and the open 100km the last time the Anglo-Celtic Plate was in Perth I was looking forward to just doing the “wee” one this time! Plus there was plenty going on, watching the youngsters rugby training in the morning and matches in the afternoon, shouting encouragement to the home nations battling out the Anglo- Celtic Plate when they lapped me, and having a few wee blethers when I was side by side with runners. It was brilliant to see so many friends volunteering at the event and even more pop up throughout the day and shout support. There was a good contingent of Carnegie Harriers, four of us running the 50km, Jonathan, David, Jane and myself, Jo representing Scotland in the Anglo-Celtic Plate with Val, Ken, Sue and Gillian supporting the Scottish team and Jennifer helping in the food tent. 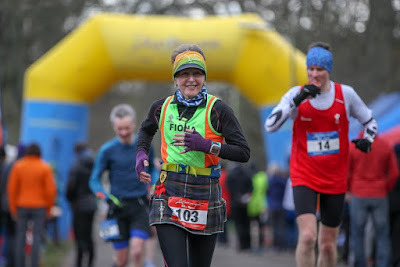 It’s been ten years since I last ran a flat 50km on tarmac (Glenrothes 50km) so I was just hoping for a good strong steady run not aiming for a specific time. There was quite a fierce wind so no point wasting energy fighting it, I just kept an equal effort round the loop and tried not to get blown into the river when it was blowing me sideways, I locked into my cruise control, knocking out pretty consistent laps only pausing at my table twice during the race to swap my water bottle and pick up a tube of Squeezy Carnation Milk and a gel that I’d laid out ready, never losing my rhythm, staying strong to the finish. I checked back my diary I was pleased to see I finished just a few minutes adrift from the aforementioned 50km ten years ago. I’m maybe making it sound like running 31 miles isn’t arduous but I held Ian in my heart, keeping me strong, he should’ve been celebrating his thirty-third birthday this weekend, he will forever remain twenty-two, mouth cancer took him from his family. No matter how tired or sore I felt during the race I was alive and well, I was here to do him proud, it was a pleasure and a privilege to run in his memory. I’d persuaded Pauline to join me for the Kielder Ultra, it would be a grand day out in beautiful scenery with no pressure, just time on feet and perfect timing being three weeks before the Fling. So after an early start, just over a two hour drive we were sitting in the Kielder Castle Cafe in front of a real fire having a pot of tea with Susan before the start. Kielder Water is the biggest man-made lake in Northern Europe and the forest built round about it is pretty impressive too. The weather was a bit grey and misty, nothing extreme, no rain, pretty perfect really. 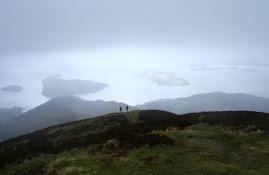 In just over half a mile you start to climb, it’s fairly steep and goes on for ages then undulates with views over the water. 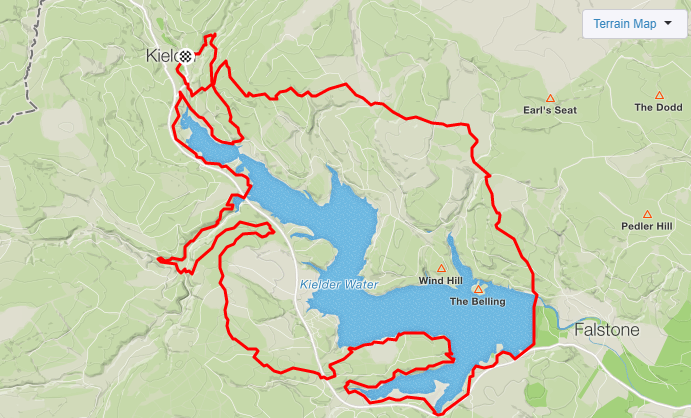 The route is a cracker with over 3000 feet of climbing, forest track, narrow tree rooted paths, mud, boggy spongy moss, heather and a smidge of road, the only real flat bit is the length of Kielder Dam. 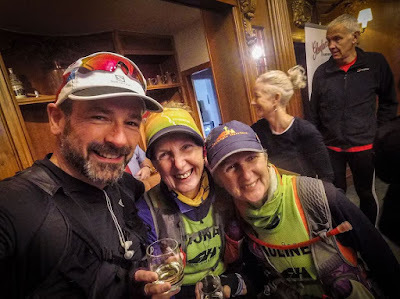 Pauline has a strategy for the Great Glen Ultra we adopt, run for a hundred paces on every hill unless it’s of nosebleed gradient then decide whether to walk or keep running. We ran the race last year but couldn’t quite remember the route until we were on it, and with having done quite a few other off road ultras we kept saying stuff like this bit reminds me of the fire track down to Fort Bill, Dunoon 55km, John Muir Way 50km, even Devilla 15km! It was fun finding similarities to other great races we’d done. We’d forgotten about one bit, there’s a right bar-steward of a hill within the last few miles that climbs for around a mile, Pauline changed the run/walk ratio to 20/20 paces and call out every transition, it takes a bit of discipline to keep it going but it saves you getting locked into constant walking and easier to get back into running without feeling clunky once you reached the top, I had a wee cheer once we started to descend then we turned onto a narrow wooded trail along a river with short steep climbs and descents and a few steps (a bit like those heading down to Balmaha), over a bridge and ta-dah the finish! Being around an hour and half slower than Perth shows the difference the terrain makes but we were over ten minutes quicker than last year so happy with that. Two variations of the same distance and I’m glad I’m pretty ambidextrous regards road and trail and enjoy doing both. While I’m waffling about 50km, it’s exactly twenty years since I first did the distance, the Speyside Way 50km organised by Don Ritchie, in those days the results didn’t appear the same evening or following day on the internet, you waited at least a week for them to arrive in the post. I still cherish Don’s personal post-it note, not all running treasures hang around your neck. Is the triple crown real? In a single word. No. 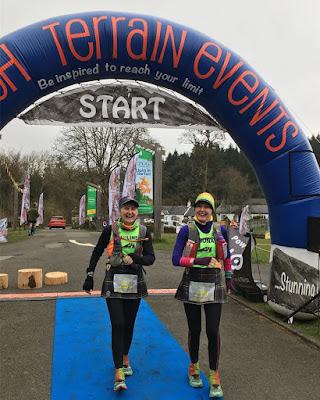 Ok, that sounds a bit harsh but I don’t want folk coming into the West Highland Way Race, especially for the first time feeling that it is a lesser achievement unless they go on to complete all three races on the route in a calendar year. It might just be me but I feel the West Highland Way Race deserves a bit more respect than to lump it with other races just for an extra hurrah. Is this lot any the less sparkly because I’ve never followed them up by dragging my tired carcass over the latter half of the route six weeks later? For the triple crown be recognised officially, I think the challenge should cross from one year to the next, completing all races within ten months, starting with the Devil O’ the Highland in August, followed by the Highland Fling in April and finishing with the final jewel in the crown, the West Highland Way in June sounds a more fitting and sensible way to do it. There could even be a separate wee presentation after the main prize-giving to those that have completed it, although I don’t think that would be fair to WHW race organisers to do it, they have been on duty long before the 1.00am start and are still on duty long after the 35 hour time limit. So unless someone else would be willing to take it on it wouldn’t be feasible. I mean no disrespect to the Highland Fling or the Devil O’ the Highlands they are both fantastic races in their own right and should not be used just to make up the numbers. There are many runners who see these races as the pinnacle of their running career. 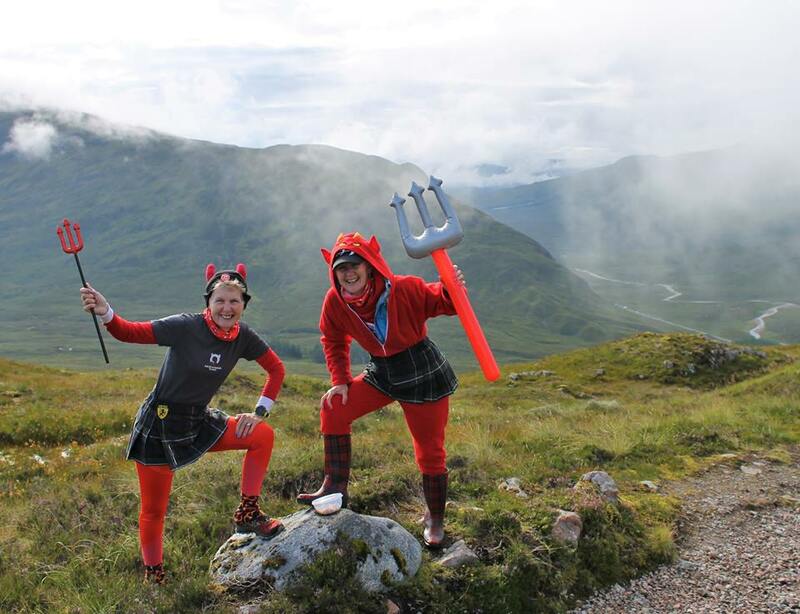 Although I have never run the Devil O’ the Highlands I have never missed it either, in the role of support I am an ever present, in the early years I crewed for lots of friends, this is one of my favourite photos, supporting Robin in 2014, these days you’ll find Pauline and I up the top of Devil’s staircase supporting everyone. These races weren’t around when I first ran the West Highland Way race I remember what it took out of me that first time, I had a good idea what was ahead, I had done Pauline’s support three times and covered the whole route in training, but the longest race I had done was the 35 mile Two Bridges Road Race, it was a huge step for me, there is no substitute for experience, also I’ve never claimed to be a great athlete, just a determined plodder. Nowadays runners with more natural ability and having served their apprenticeship learning their craft might manage without damaging themselves, with the vast amount of races around, you can build up gradually, the Great Glen Ultra and Glenmore 24 are perfect for practicing running without sleep, with both of them you only lose one night's sleep, (even if you manage to run 100 miles in a 24 hour race don’t let that lull you into a hope of a sub 24 hour WHW, they are different beasts) so folk are standing under the tunnel in Milngavie with a lot more experience than I ever had, although regardless of the amount of times I’ve done it doesn’t get any easier and every year has different challenges, I still feel I need more than six weeks recovery before taking on another ultra. It is just that over the years, I’ve seen many get to the end of the Devil O’ the Highlands claiming a triple crown totally spent, injured and scunnered to the extent that they have had to take an exceptionally long time away from running to recover then build up slowly again, sadly, I know one person that never ran again. Alright, I’m guilty of sounding like your Mum saying it’s cold out put your coat on, I have your best interests at heart and if you want to do a personal challenge of all three races on the West Highland Way in a calendar year go for it, but take a few years building up, be careful and kind to yourself and take the recovery you need so you don’t spend the following year plagued with illness and injury and never lose your love of running. A 2.45am alarm...it must be a race day! A tad early but I like to have a decent breakfast and the time to eat it. Pauline, Michelle and I were meeting at the Halbeath Park and Ride for 4.15am before we drove up. Registration and the finish was at the Glenfiddich Distillery, we arrived in good time to register and have a bit of a blether with folk I haven’t seen in a while. With not much faffing we were ready and went over to get on one of the busses waiting to take the runners to the start at Glenfarclas Distillery, we timed it nicely that we were on the first bus to leave. So was Dougie Vipond, the Adventure Show was covering the event, now how many times does it take Dougie to get on a bus? Hundreds! Well, maybe a slight exaggeration but the bloke with the camera made him do it loads! Looking around just before the start I realised there were a lot more runners than last year, we were quite near the back but that was ok, it’s a stiff wee climb straight from the off, and with just a fifteen year old Glenfarclas for a warm up we weren’t going to be pushing the pace, besides the Dramathon is about having a good time not doing a good time, it’s one just to relax and enjoy. The scenery is beautiful especially with the autumn colours, the sun was shining, it warmed up, my gloves were off, sleeves pushed up and I even removed my Buff. 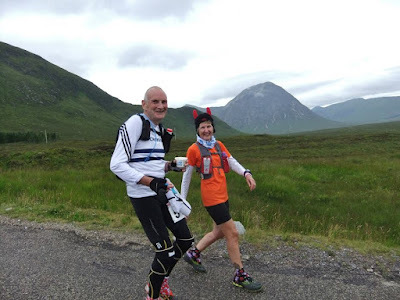 With no mile markers and mostly trail it feels more like a wee ultra than a marathon, folk were chatting away and we even walked the couple of steep wee climbs, normally I have a rule for marathons. No Walking Allowed! But the Dramathon isn’t your normal marathon. 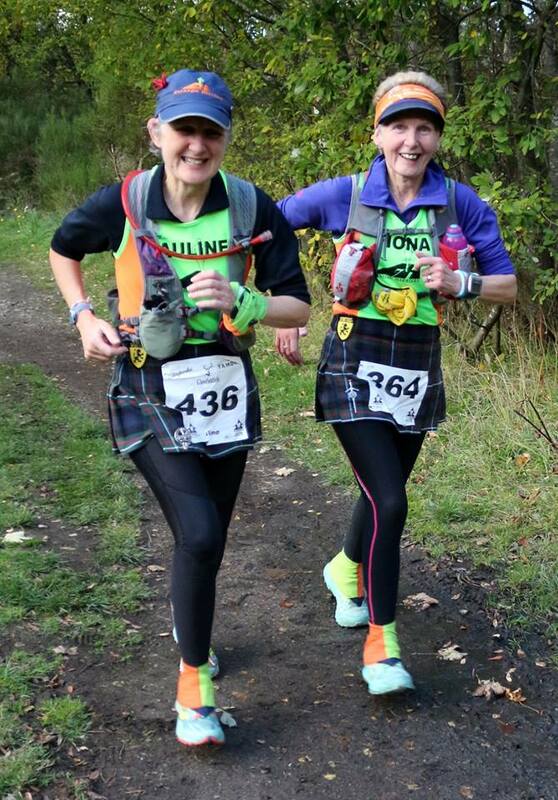 Pauline and I were happy to scamper along together but her Achilles tendon was giving her major grief and holding her back a bit, I was happy with the easy pace and didn’t mind that Pauline was using the drink stations for a bit of a skive, pausing to eat cake and sweeties. After around nineteen miles, along the old railway we were working at a slightly higher rate, not quite the Flying Scotsman but pulling the miles in nicely, we went past Deziree and camera man, she shouted “How’s it going?” We steamed on by, me with a double thumbs up, cheesy grin and “Fine, thanks!” Maybe Pauline played it cooler, we weren’t stopping for a chat, this wasn’t the London Marathon and Deziree presents The Adventure Show not Blue Peter! Another few miles in I was regretting not using the port-a-loos at Aberlour, I was sure I’d be able to hang on but now I was bursting and trying to run with clenched buttocks was messing with my stride, so with around three miles to go I had to make a pit-stop, Pauline said she wanted to wait for me but at this stage if she stopped she might not get going again, in other words that translated to “Ok, I’ll just see ya at the finish then!” Her consoling parting shot was “Maybe once you’ve been, you’ll be more relaxed and might manage to put a spurt on and catch up!” Pfft! And after me hanging back for her when she was not the most comfortable! Actually I would’ve felt the same, no point prolonging it at this stage. Once I got going again I tried to put in a bit of effort but my rhythm was broken and a clunky shuffle was all I could muster, I reinstated my no walking rule and slogged it out to the finish and the best goody bag ever! Pauline was waiting for me and so was Michelle, disappointed with injuring her knee but sensibly pulling out. We didn’t hang about long afterwards with another three-ish hour drive home and with me being the designated driver there would be no celebratory nip for me until I was home. But it was worth the early start and long drive, a cracking route, gorgeous scenery, a well organised event and whisky galore! Slainte! A holiday home in Portree was booked and we were lucky that Ken, Val and Allan were joining us, Gillian was meant to come too but an injury scuppered her running and wasn’t recovering as quickly as she’d hoped so she decided to cancel her leave and save her holidays for when she would be able to have adventures. They were happy to fit their walking, cycling and photographing around dropping us off and picking us up. 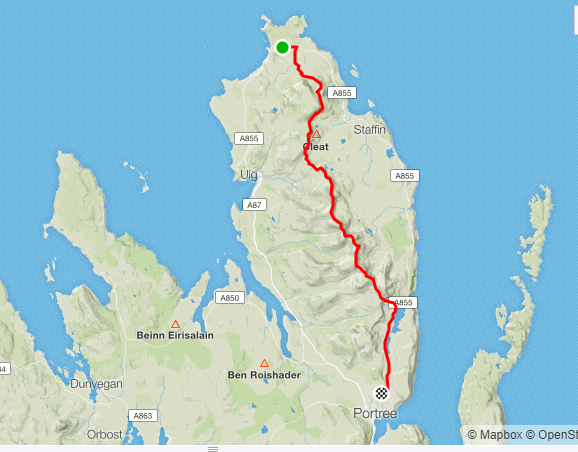 Doing it at the beginning of October meant the weather could throw a spanner in the works, we weren’t worried about doing the route top to bottom, just fitting the sections around the best day for the Trotternish Ridge. We planned to do it over four days and we had to shuffle things about as the weather changed, Andy joined us for the two big days. Ken dropped us off then headed for a walk and to watch the golf in the Broadford Hotel where we’d meet him after our run. It was a sleeves up, sleeves down, sunshine, showers and a smattering of rainbows kind of day. 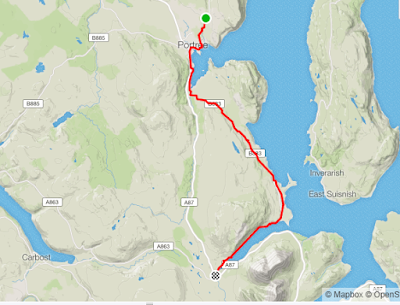 A straightforward run on road to start with, then a rough track and along the shore to the ruins of Boreraig, a village abandoned during the Highland Clearances. The showers had been quite short and not too heavy until we were on the Marble Line, it was stotting down, Pauline wondered whether we should stop and pull on our waterproof breeks, I was sure I could see the end of the shower and with only a few miles to go, I shouted to just keep going which might not have been right choice, we were drookit by the time it eased off! But the wind was fairly strong and dried us out a bit, at least we’d stopped dripping by the time we reached Ken at the Broadford Hotel. We had originally planned to do the Ridge today but heavy rain and low cloud was forecast so we decided to go from Sligachan, Andy drove down and left his van at the house then Val dropped Andy, Pauline and myself at Sligachan before heading to Elgol for a walk and to take photos. Ken and Allan cycled around Sligachan for a bit then went out the Moll Road until the “pot hole” and back. We had arranged with Val to pick us up at the Blaven car park at around 4.30pm but Andy shot off like a puppy let free, I laughed and said to Pauline we’d better phone Val and make it 3.30pm! Andy soon settled the pace down to something we could keep up with, even assisting Pauline over steppy stones! A beautiful route through Sligachan Glen surrounded with magnificent mountains, Sgurr nan Gillean, Marsco and Bla Bheinn to name just a few, views to make your heart skip as well as the legs and I was really quite surprised the deer didn’t scamper off when they saw us. The rain had been spitting on and off through the wind as we approached Camasunary, we went into the bothy for a wee breather and to put on waterproofs, we’d be moving a lot slower from here. Heading to Elgol, it was a bit boggy to start with, then a wee steep climb to the narrow path above the the shore, it’s fine as long as you’re careful, Pauline isn’t too happy with heights, and it didn’t help that I was behind her giggling at her leaning to her left on the more exposed bits, so I went in front, but I could still hear her make the odd squeak! The rain was now torrential, my camera was pretty wet so I stopped taking photos just before Elgol, there was no point but here’s what you can see on a dry day. We nipped into the toilets and I spent longer than normal under the hand dryer, no chance of getting dry but nice to feel the warm air. From Elgol it was mostly just a soaking slog on tarmac for eight miles to the car park, it’s probably a lovely road to run on a nice day but after stunning Sligachan Glen it wasn’t my favourite bit, the rain never let up, eventually we could see Val sitting dry and cosy in her car, We had left bags with a change of dry clothes with her in the car but it would’ve been pointless trying to change in the sideways rain, I was a bit worried Val wouldn’t let us in case our soggy bottoms ruined her seats, but she had some blankets in the boot, we could sit on them, yay, we were allowed in! It didn’t seem too long until we were back at the house in Portree for another shower, a hot one! Poor Andy had about another half an hour drive until he was back home and out his soaking gear. Day 3 - Duntulm to Portree - The big one! Yep, you read that right, just short of ten hours for twenty four and a half miles! 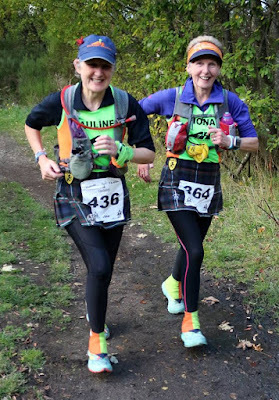 My pace will never set the heather alight and this was no race day, we were on our holidays, but even during the race the leaders take at least seven hours for this section, the times reflects the terrain and never to be underestimated. We planned an early start, Ken drove Pauline and I up, picking up Andy with a change of clothes for Ken to take back for after the run, we were finishing at the house since it was perfectly placed just off the the Staffin Road down from the Wigwams, Andy and Karen were joining us for our evening meal. Ken dropped us off at the phone box in Duntulm, Allan had instructions to have the bacon and egg rolls ready for his return, they were heading over to Raasay with their bikes unfortunately Ken’s bike gave up the ghost, I think they got a bit of cycling in before it died. A nice gentle couple of miles on road for starters, then around a mile of heather bashing and bog hopping, Andy was keen to try and keep his feet dry so we picked our way through carefully, I think he was fairly successful, me, not so much, within five minutes both feet were soggy, at least I only went in up to my ankles, it could’ve been a lot deeper! 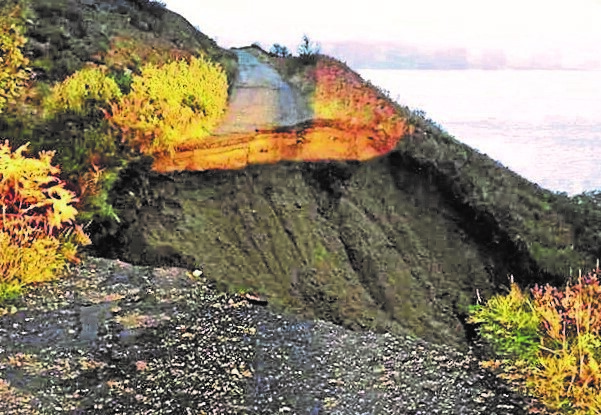 The weather was dry but strong winds were forecast, (the travel report on the radio warned of bridges closed to high sided vehicles and to check ferrys for cancellations) I’m glad it was slightly behind us blowing us up the steep grassy climb to start with. Once at the top you could feel the full force of the wind, I had to turn my peaked Buff back-to-front, the peak was blasted down on my face and hampering my vision, I was glad when we headed down into the slightly sheltered Quiraing. We started to see a few walkers coming towards us, then loads of walkers, yep, there was a bus trip! After we crossed the road and headed upwards we never saw another soul all day. I’m a bit of a light-weight and need my heavy winter coat and boots to make eight stone so I was a wee bit concerned about being blown off the Ridge, one reassuring thought, with being small built at least I don’t offer much resistance sideways on! Luckily the wind wasn’t gusting much, it was just a constant fight, and we stayed well away from the edge. I could see for miles, looking over to Uig, the ferry was coming in, Andy pointed out the Fairy Glen, the Ridge wound on and we followed, we went up, we were blown sideways, we went down, we went up, we were blown sideways, we went down, we went up, we were blown sideways, we went down, with the wind chill, it was pretty cold, my hood was up and although fastened tightly, it was a deafening rattle in my ears. Progress was slow and steady, the effort arduous, but boy I was loving it, we took a wee breather from the wind behind a huge boulder, I wittered on about what a wonderful day I was having, one I was going to remember with a smile forever, Pauline turned and bellowed “What?” she had her hood up too and hadn’t heard a word “Never mind!” I answered, I’m sure she was enjoying her day as much as I was. Time was marching on, quicker than we were, we decided that if we were eating around 8.00pm we wouldn’t have time to continue the Ridge so we descended at the Storr, for a short run into Portree on the road, missing out the “Bog of Doom” as Andy called it, oh dear, what a shame, never mind, I’ll look forward to doing that another time! 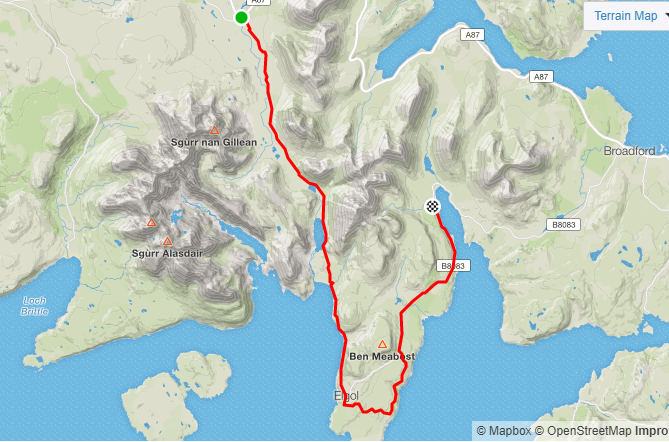 Good food, beer and company was waiting, I wasn’t too upset about missing out a few miles, although I really didn’t want this run to end, the epic surroundings taking me beyond my fatigue. The Trotternish Ridge is stunning and I look forward to doing it again. 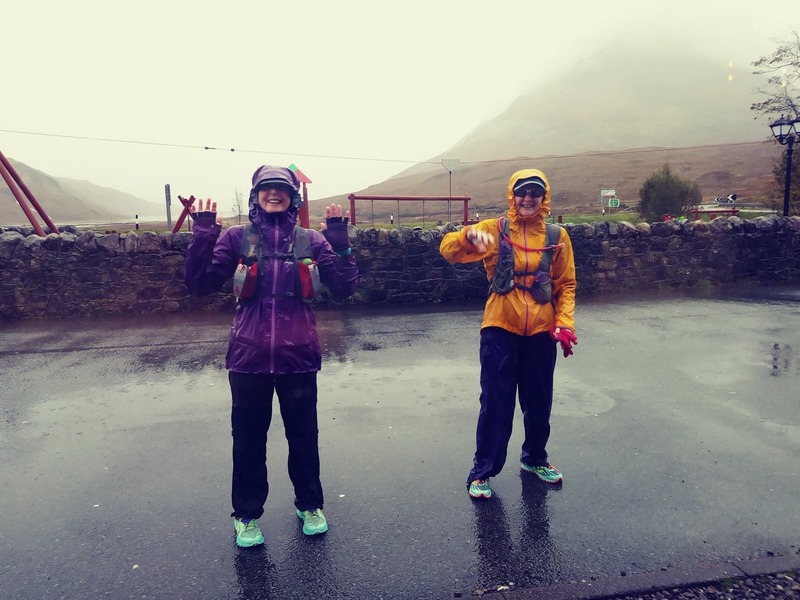 We had a chill out, rest day after our epic Ridge run before our final day on the Skye Trail, a low level mostly on road, not much in the way of hills, celebrating finishing with lunch in the Sligachan Hotel. With the weather we had for our final day it was just as well this was the “easy” section, Pauline and I left the house walking to the Staffin Road to stretch the legs before running, the bus shelter was about a hundred yards away, we went inside it to put on our waterproof trousers, we hadn’t even started the watches yet! Through Portree we stop for a wee blether twice, it was lovely to see a couple of folk we know, then opposite the Aros Centre we turned down onto the shore, the wet stones, slippy with seaweed underfoot made it slow going, just as well we were watching our feet as the cracking views were non-existent. The Braes road was surprisingly busy with traffic, and fairly undulating which wasn’t so surprising, this is such a sheltered area that foxgloves and garden flowers were still in summer bloom, a different climate to the north west of the island. During our runs in the rain I’d look up to the sky and say hopefully “I think it’s brightening up!” today it was just a lie, at no point ever did the rain look like it was going off, maybe not just so torrential at times but it never promised to ease up. Once off the road and onto the rough shore path along Loch Sligachan it was either boggy or if solid underfoot, a burn, we were carefully placing our feet, a lot of water flowing from the hill now required great care, we were wading through fast flowing burns where on a previous run a few years ago from Sligachan to the Braes and back we just had a skip and a hop over steppy stones without breaking stride. We were a bit behind schedule, Ken, Allan and Val were in the hotel waiting for us, and phoned with concern, they were watching the waterfall and weren’t sure if we would get over it, and if necessary they would drive back round to the end of the Braes road and pick us up. I reassured them that we were fine, taking our time and we wouldn’t do anything daft, I’ll phone back when we were at the waterfall and let them know what we were doing. 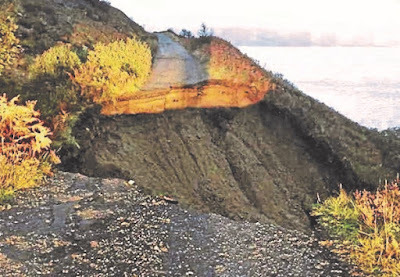 Once there we walked up and down to find the best place to cross, the flow was fairly strong but never went over our knees, Pauline phoned to say we were safely over and we wouldn’t be long. The path disappeared and it was another bog hop to the campsite and more wading through burns until we got to the Hotel. Yay! The Skye Trail was complete (except for the Bog of Doom) in some challenging conditions and I’m not disappointed in the slightest that the weather wasn’t on our side, it was an epic adventure with memories I’ll cherish! Once inside the Sligachan Hotel we dripped off to toilets to change, now warm and dry we ordered beer and lunch, I upgrade the Cuillin Skink (same as Cullen Skink but with mountains out the window) from starter to main course portion, it was the largest and finest Cullen Skink I have ever had. 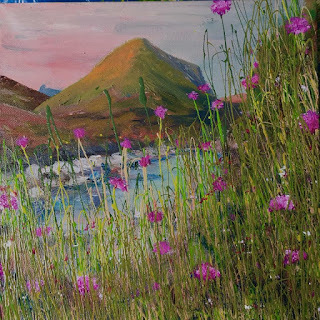 On the wall was art from local artists for sale with the proceeds going to Skye Mountain Rescue, I have admired Jeremy Rossiter's work for a long time so I treated myself to his painting of Marsco, a superb momento of an epic week now hanging in my living-room. Flaming typical, the rain had stopped after we’d had our lunch and the following day the sun was splitting the sky, at least it was a pretty drive home! A fantastic few days in great company and stunning surroundings even though we didn’t get to see some of it this time, but that just makes it all the more special when you do. Thank you Ken, Val and Allan for your company and making the logistics possible for Pauline and I do the Skye Trail over four days. Pauline wondered that after we did it would we be more sympathetic to runners during the race lingering in checkpoints? Ha! Well, if you’ve ever come into a checkpoint where I’ve marshalled you’ll know I don’t do sympathy, so if you come crying into Sligachan don’t expect a “There, there, there!” from me. Just make sure you know what you’re taking on and your ability to do it justice.